The City of Melbourne is proposing a $232 million redevelopment project designed to rejuvenate almost an entire CBD block, with ambitious plans for it to become the city’s most sustainable urban landmark, reports The Age. The block is located behind the Town Hall, running between Little Collins Street and Bourke Street, and bounded by Royal Lane and Russell Place. 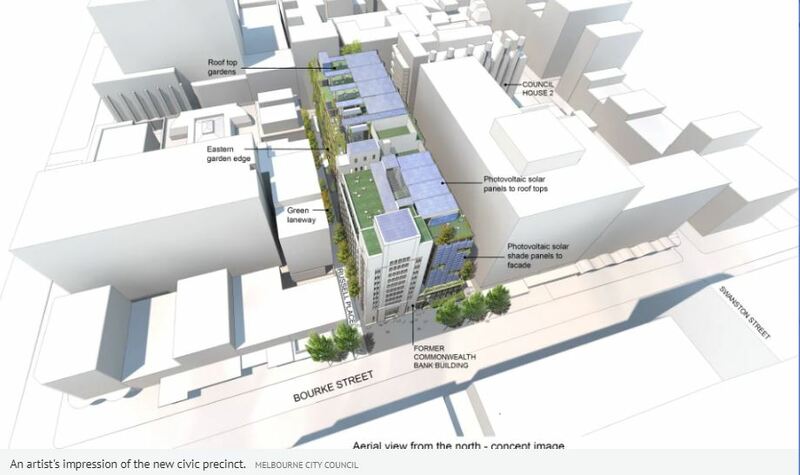 Under the plan, a 10-storey, 40-metre proposed development with retail spaces, laneways, commercial office spaces, publicly accessible rooftops, and a new community forum, would replace the 50-year old Council House building on Little Collins Street. As part of the proposal, the Victorian heritage-listed former Commonwealth Bank building on Bourke Street would be restored. Almost two thirds of the new precinct would be used for community spaces and commercial and retail, with the remaining space allocated to the City of Melbourne for office space. Lord Mayor of the City of Melbourne, Sally Capp, has backed the plan, says The Australian. “This redevelopment will create a new landmark for Melbourne in terms of sustainable urban design and how we activate our streets for people to enjoy,” Ms Capp said. The energy-efficient design would have a six green star rating and a carbon-neutral certification target. It would also feature end-of-trip cycling facilities, ground-source heat exchange, an electric vehicle-only basement, and rainwater tanks and water-sensitive urban design to capture and reuse stormwater. But urban planning expert Dominique Hes, who researched the council’s Council House 2 project, said aiming for a six-star rating was no longer sufficient for a building to be deemed sustainable. “Six star is wonderful, but not leading edge anymore because they did that 10 years ago,” Dr Hes said. Dr Hes said if done well, the proposed precinct has the potential be more impressive than Council House 2, which has received numerous accolades, including a Planning Institute of Australia president’s award. “I think that it’s a development that could really revitalise that part of Melbourne,” she said. Under its final investment case, the project would return $153.3 million to the Town Hall through rent and productivity savings over a 30-year period, notes the AFR. Councillors will consider a recommendation to submit an application for a planning permit at next Monday’s Future Melbourne Committee meeting. If the project receives the green light and relevant planning approvals are completed, construction could begin in early 2020 and be completed in 2024.